In 1956, Princeton University cognitive psychologist George Miller published a study called "The Magic Number Seven, Plus or Minus Two: Some Limits on Our Capacity for Processing Information." In this landmark study, Miller showed that people were only capable of holding a certain amount of information in conscious, working memory at a time. For teenagers and adults, he found this number to be no more than seven items--thus his "magic number" of seven. Moreover, Miller found that, when someone tries to hold in mind and think about more than this short-term memory "buffer" can hold, something has to go. That is, when a person tries to add one more item into conscious memory, something else that he was holding in mind previously drops out. It's a biological constraint. We simply "max out" and are incapable of holding anything more in memory until we do something with what we already have in our minds. The findings of this study have been replicated many times and, in fact, more recent studies have shown that Miller's number seven, if anything, is a bit optimistic. Further studies have shown that we have different capacities for different information (numbers as opposed to words as opposed to sounds, for example), and that, even for adults, the number of items we can hold is often closer to 2-4 than seven. As if that weren't challenging enough, working memory has a few more limitations on it, especially for students in school: (1) the developmental aspect of working memory and (2) time limits on working memory. Let's look at each of these separately. Clearly, the limits of working memory have powerful implications for teaching practice. But for teachers working with younger students, the challenge is even bigger. This is because the limits of one's working memory buffer, like so many other aspects of the brain, are developmental. Researchers since Miller have found that a pre-school child--say four or five years old--has an average working memory capacity of two items, plus or minus one (depending on a number of factors). For children between age five and fourteen, the average limit is five items, plus or minus two. And for people fourteen and older, the average number is seven, plus or minus two. Why is this important? Well, let's say you're a pre-school or kindergarten teacher, and you read a story to your students. You then ask them to name the three main characters in the story, and you find that few of them can do so. Should you be upset about this? Should you be worried that there's something wrong with your students? Should you accuse them of not paying attention? No, no, and no! Remember that a child of this age has a working memory capacity of two, plus or minus one. This means that most of your students won't be able to recall the names of three major characters when you quiz them. Your question is simply very challenging for them at this stage of their development. Working memory limitations also have implications for classroom management. Let's once again use a kindergarten teacher as our example, and let's say that, as students enter the classroom in the morning, the teacher says, "Kids, hang up your coats, put your lunch boxes in the cubbies, and have a seat on the carpet for our morning meeting." Simple enough directions, yes? Well, yes, there's nothing complicated about any of those directions, but there are three directions given at once. It is quite likely that this teacher is going to be dismayed when, a minute later, she finds that some students have hung up their coats and deposited their lunch boxes, but are now wandering around the room aimlessly instead of sitting on the carpet, while other students are sitting on the carpet waiting for the morning meeting to start, but are still wearing their coats and holding their lunch boxes! This teacher would be well-advised to give one, or no more than two, directions to the students and monitor them for compliance before giving another direction. As the students get older, their working memory capacity expands, but it would still be a good idea for teachers of upper-elementary and middle school students to keep the number of tasks they require their students to think about at one time to a minimum. In fact, even teachers of high school students and adults should always be aware that their students' working memory maxes out at a certain point. Another issue with working memory has to do with the amount of time you ask your students to deal with a certain quantity of material in working memory. 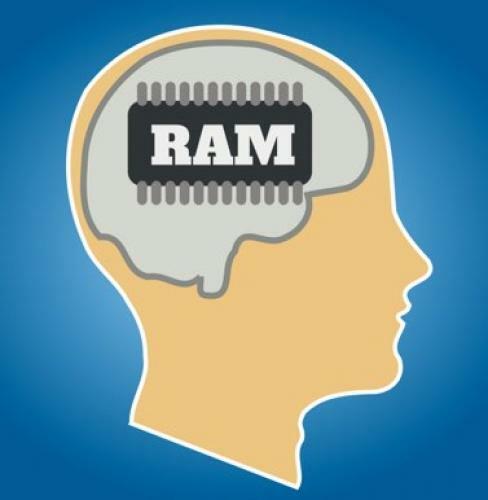 Even if you are careful to limit the amount of material you ask them to process at a time, if you require that they continuously use their working memory at near-maximum capacity, they will soon fatigue and performance will drop precipitously. Many researchers have investigated this issue, starting with Hermann Ebinghaus way back in the 1880's. So we now have more than a century of research into this issue. What have been the findings? Well, the consensus is that young adults and adults can normally process an item intently in working memory for ten to twenty minutes before mental fatigue or boredom kicks in. So, if you are asking high school students to work with challenging material for longer than twenty minutes at one stretch, you're probably going to run into problems. And once again, time limitations on working memory are developmental. So younger students are able to concentrate on challenging material for shorter stretches of time before maxing out. OK, so what are our classroom "take aways" from the research on working memory? It's pretty obvious. If we want to be efficient with our teaching, we need to make sure that we aren't overtaxing our students' working memory buffers, in terms of both quantity of material and the amount of time we ask them to work with that material before we give them a break. When your lesson includes "chunks" of input (lecture, reading, watching a video, etc. ), make sure that each chunk contains no more than three main ideas that you want the students to grasp and think about. For upper elementary students, try to limit the main ideas to two per chunk, and for early elementary, keep it to one main idea per chunk. Also, make sure that you limit how long you spend on each chunk of input. What should those time limits be? I have seen different numbers thrown out by different people, but the numbers I like to share with teachers, based on the research and also on personal classroom experience, as these: for pre-school and primary grades students, keep the chunks to no longer than five minutes. For upper elementary, think in terms of 6-8 minute chunks. For middle school, think in terms of 8-10 minutes. And for high school and up, think in terms of 10-12 minutes per chunk. One caveat: There is an important exception that I should mention. The numbers I give above have to do with your standard lesson plan where students are inputting new material (listening to the teacher talk or reading a text, for example), followed by some kind of processing activity where they work with that material. However, one factor that can extend the time limits of working memory ismotivation. If you can get students into the "zone" (what Mihaly Csikszentimihaly calls the "flow state") where they are highly engaged with a topic (this usually happens when the students are working on an engaging project or are involved in some kind of game-like situation), they can focus intently for much longer at a stretch before needing a break. So, if your students are "in the zone" with their work, you can ignore the advice above about chunking the lesson. In such cases, don't disturb them--go with the flow! Willy Wood is an educational consultant and expert on how the human brain learns. He is the co-author of The Rock 'N' Roll Classroom: Using Music to Manage Mood, Energy, and Learning (http://www.amazon.com/The-Rock-Roll-Classroom-Learning/dp/1412999766) and publishes the e-newsletter, Neuro News. You can contact Willy at teachingthatsticks@gmail.com.